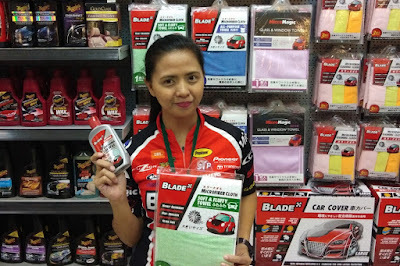 The country’s largest automotive accessories retail chain, Blade is now offering its own line of car care products and accessories. With stores strategically located at SM, Robinsons, and Ayala Malls around the country, car owners can now purchase value-oriented Blade-branded Carnuba car wax, microfiber cloths, and special-edition water containers. This is on top of the existing line of products such as car covers, air fresheners, and the like. For instance, the Blade Car Wash Set bundle costs only less than P 600 and already includes a Wash & Wash Shampoo, Carnuba Wax, Tire Black, Chamois Towel, and Microfiber Cleaning Cloth. A set of three Blade Carnuba Wax sets you back less than P 300 while the Blade Tire Black is less than P 100 for 100 mL. Aside from Blade-branded products, the automotive accessories retail chain also carries a wide array of products for the discerning enthusiast. This includes brands such as Sparco, OMP, Goodyear, Polaroid, Blaupunkt, Pioneer, Wurth, Sonax, and 3M.